244 pages | 120 B/W Illus. Vacuum plays an important role in science and technology. The study of interaction of charged particles, neutrals and radiation with each other and with solid surfaces requires a vacuum environment for reliable investigations. Vacuum has contributed immensely to advancements made in nuclear science, space, metallurgy, electrical/electronic technology, chemical engineering, transportation, robotics and many other fields. 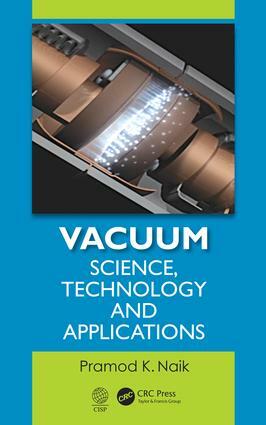 This book is intended to assist students, scientists, technicians and engineers to understand the basics of vacuum science and technology for application in their projects. The fundamental theories, concepts, devices, applications, and key inventions are discussed. Pramod K. Naik has been actively involved in Vacuum Science & Technology since 1958. He obtained Ph. D. in Physics from the University of Bombay (now Mumbai University). He investigated electrical oscillations in "Philips Ionization Gauge" and allied type of D.C. glow discharge with Dr. V T Chiplonkar at the Institute of Science, Mumbai. He joined the Atomic Energy Establishment, Trombay (now Bhabha Atomic Research Centre) at Mumbai in 1961. At BARC, he was engaged in development of high and ultrahigh vacuum components and systems. He was appointed as a member of the expert group formed for the Synchrotron Radiation Source. At BARC, he developed thermal desorption spectrometer and investigated entrapment of energetic inert gas ions near molybdenum solid surface. He has published many papers in reputed international journals. He worked with Dr. R G Herb at the University of Wisconsin, Madison, Wisconsin USA in the field of ultrahigh vacuum and developed the glass orbitron pump. He has also worked at the Westinghouse Electric Corporation (now Eaton Corporation) where he was engaged in absorption of Vacuum Interrupter technology. He worked as a manager at Crompton Greaves, Aurangabad. He has been associated with the Indian Vacuum Society and has organized a number of short-term courses in Vacuum Science & Technology. He received the Lifetime Achievement Award for his outstanding contributions in the field of Vacuum Science & Technology from the Indian Vacuum Society in the year 2003.